The white man accused of killing nine parishioners at a black church in South Carolina last month wants to plead guilty to over 30 federal charges, but his lawyer said in court on Friday that he could not advise his client to do so until prosecutors say whether they will seek the death penalty. During a brief arraignment in federal court, defense attorney David Bruck said he could not counsel his client, Dylann Roof, to enter a guilty plea without knowing the government’s intentions. US magistrate judge Bristow Marchant then entered a not guilty plea for Roof, 21, who faces 33 federal charges including hate crimes, weapons charges and obstructing the practice of religion. Appearing in court in a gray striped prison jumpsuit, his hands in shackles, Roof answered yes several times in response to the judge’s questions but otherwise did not speak. The federal prosecution, particularly on hate crimes, has been expected since the 17 June shootings at Emanuel African Methodist Church in Charleston, South Carolina. Early on, officials with the US Department of Justice said they felt the case met the qualifications for a hate crime, and Roof was indicted by a federal grand jury about a month after the killings. Roof appeared in photos waving Confederate flags and burning and desecrating US flags. Federal authorities have confirmed his use of a personal manuscript in which he decried integration and used racial slurs to refer to blacks. Because South Carolina has no state hate-crimes law, federal charges were needed to adequately address a motive prosecutors believe was unquestionably rooted in racial hate, US attorney general Loretta Lynch said during a news conference announcing Roof’s federal indictment. 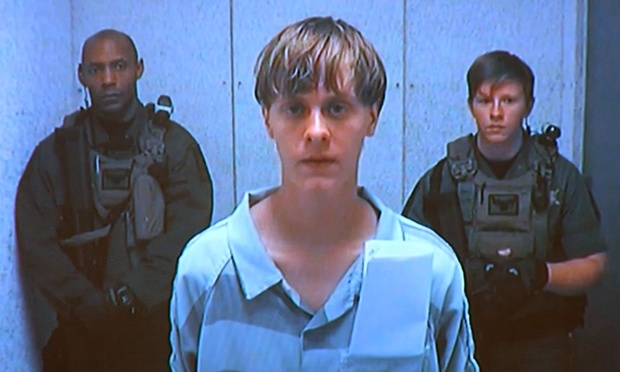 Eighteen of the 33 charges against Roof could potentially carry the death penalty, while conviction on each of the others could mean a life prison sentence. Each charge also carries the possibility of hundreds of thousands of dollars in fines. Also during Friday’s hearing, Marchant accepted Roof’s application as an indigent defendant meaning the state will pay for his attorneys. Marchant also heard briefly from victims’ family members, who at Roof’s bond hearing in state court expressed statements of mercy and forgiveness despite his alleged crimes. On Friday, several relatives made similar comments in federal court. Gracyn Doctor, daughter of another victim, DePayne Middleton Doctor, said she misses her mother greatly but wouldn’t let Roof get the better of her. “Even though he has taken the most precious thing in my life, he will not take my joy,” Doctor told the judge.